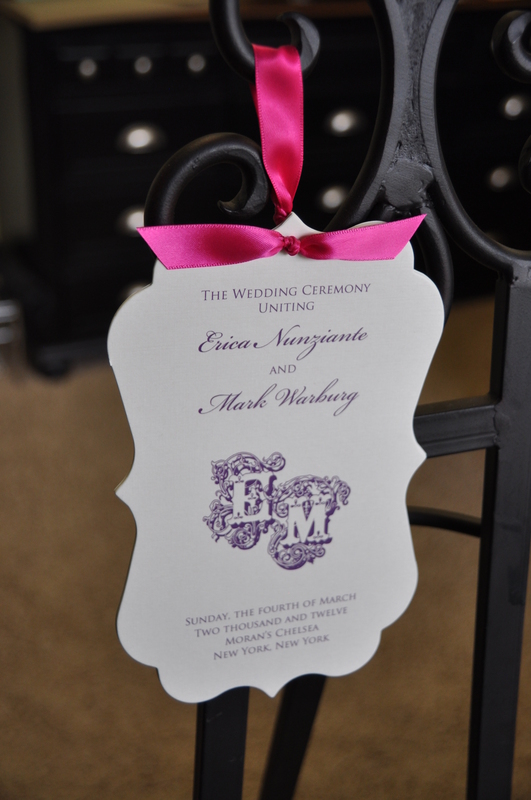 We are working with a customer today who wants to hang a wedding program from each chair at the ceremony. There is one that is all over the internet done this way from Martha Stewart Weddings and I’ve often thought that we needed to add our version of something similar, but different at the same time. Here is our Meagan wedding program tied differently, so that there is a loop in the back where it could be hung from a chair. What do you think? 1) Take a single piece of ribbon, about 12″ long and fold it in half. 2) Put the folded end into a single hole and pull it through enough to create the loop. 3) Knot off the ribbon on the backside of your wedding program, so that it will not slip through the hole. 4) Take the two loose ends of the ribbon that are on the front of the program and tie them into a tight knot. Or, just buy your wedding programs from Wiregrass Weddings and we’ll hot cut the ribbon for you (so that it’s won’t fray) and assemble them for you!